How often should you drink TEA+ Defence? Is TEA+ Defence safe for those with a gluten intolerance? Is TEA+ Defence suitable for vegetarians and vegans? Does TEA+ Defence replace my daily multivitamin? 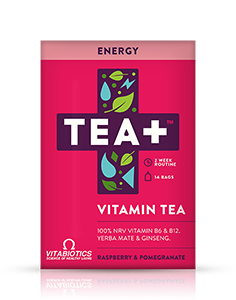 TEA+ is a new range of vitamin infused teas designed to help maintain general health and wellbeing. 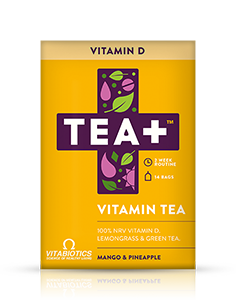 We have created a unique blend of vitamins, herbs, fruit and green tea with the aim to help in your daily wellness goals when needed most in a convenient, nutritious and delicious cup of tea. We recommend drinking at least one cup of TEA+ Defence per day as part of a healthy lifestyle. The recommended daily limit is 5 servings (200ml per serving). All of our teas have been developed and independently tested to take the known effect of boiling water in vitamins into account to ensure you get the required dosage in every cup when infused for 3 minutes. Our teas contain a moderate amount of caffeine from green tea. Each TEA+ contains around the same amount of caffeine as a regular cup of black tea, which, depending on brewing, is typically around 25mg per cup. Our teas contain no artificial sweeteners, they are flavoured only with natural fruit flavours to ensure a smooth and gently fruit flavoured tea. Our tea bags are 100% free from any chlorine. They are Oxygen bleached to give the white colour but the process is 100% natural and 100% free from chemicals. We’re proud to say our TEA+ tea bags are polypropylene free. The recommended limit of caffeine for pregnant and breastfeed-ing women is 200mg per day. Our teas include green tea and so provide about the same level of caffeine as a cup of ordinary tea (around 25mg). As with food supplements, we recommend that you consult your doctor or pharmacist before using if you are pregnant. TEA+ Defence is gluten free. TEA+ is suitable for vegetarians however it is not suitable for vegans. TEA+ Defence provides 80mcg vitamin C and 1.25mcg vitamin D per cup. if you wish to take an additional multivitamin supplements, the extra vitamin C and D content would be within safe levels. Our teas taste fantastic over ice, either on their own or as a more nutritious base to smoothie mixes. Adding the required number of tea bags to hot water which is then allowed to cool and combining with ice, fruit pieces and a sweetener of your choice makes a refreshing and nutritious drink.